Our son, Joseph (Joey) Seco, was born and raised in Miami, Florida. On July 6, 2006, my wife and I received the phone call every parent fears; Joey was involved in an accident and was being air lifted to Jackson Memorial Hospital’s Trauma Center. After endless hours, our world was turned upside down when the neurosurgeon finally met with us. Joey had suffered a fractured C7 (cervical), T3 & 4 (thoracic) vertebrae, lacerated spleen, fractured scapula and clavicle. In addition, his lungs and heart were badly bruised. Joseph was diagnosed as a quadriplegic. Due to his lung and heart condition, surgery was not possible for five weeks. During this time in the intensive care unit, Joseph suffered a number of complications causing the loss of 55 lbs., most of it muscle tissue. Finally, the day of surgery came and after a ten hour surgical procedure, where the cervical and thoracic vertebrae were replaced, Joseph was suited with a neck and torso brace to prevent sudden movements and allow his body to heal. He spent the next 3 months hospitalized. Joseph continues to experience a number of different therapies; including physical, acupuncture, electrical muscle stimulation and hyperbaric treatments. Although sometimes physically and emotionally exhausting, Joseph’s determination, strong faith in God and support from family and friends propels Joseph to continue pressing on until he is able to one day walk again. Unfortunately, my wife and I have also been forced to face the reality of Joseph’s medical expenses, special equipment needs and above-mentioned therapies, exceeding tens of thousands of dollars which of-course, are not covered by the insurance company and are essential to his recovery. Therefore, we have contacted HelpHOPELive which is a highly regarded non-profit organization with tenure of more than thirty years in the area of organ and tissue transplant and since 2000, with spinal cord injury patients. 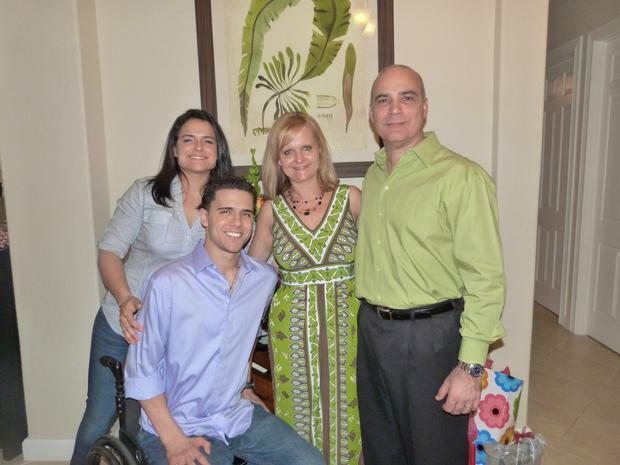 As many of you know, last February 2013 George and Joey traveled to Panama to undergo stem cell treatment. Following his treatment Joey stayed In Orlando and underwent intense physical therapy at a state of the art spinal cord rehab center. With God, our family and friends support, we believe in our son’s complete healing and recovery from his injuries. The slogan for this fund raising campaign is “GO JOE”. · 2nd stem cell transplant treatment: $48,000.00. Studies have demonstrated that patients undergoing this treatment have rendered improvement; such as the regaining the ability to feel hot and cold temperatures, sensation throughout the extremities, and most importantly movement of the affected areas. Unfortunately, the FDA has not approved this treatment in the USA. See his video and be amazed at how far we have come. · Return to Orlando for a second one month long stay at the rehab center for intense physical therapy: $6,000.00. · Therapies – Acupuncture, Hyperbaric Chamber and Electrical Stimulation $1,650.00 per month. Our sincere gratitude for your donations. We could not have done this without your generosity. As of today, Joseph has regained most of the lost body weight and muscle mass in his upper body. Although we were told by the doctors that he would not regain the use of his arms or hands, Joseph has full range of motion in his arms and his right hand function has improved significantly. He has now begun to move some toes and has regained sensation on his right side of his body. Joseph is now continuing his collegiate studies and maintains his daily therapies. We believe that God, the Stem Cell transplant and the physical therapy have tremendously improved his condition and improve in his recovery. Joseph has chosen to fund-raise with HelpHOPELive in part because HelpHOPELive provides both tax-deductibility and fiscal accountability to his contributors. Contributors can be sure that funds contributed will be used only to pay or reimburse medically-related expenses. To make a credit card contribution to Joey’s fundraising campaign, call 800-642-8399 or select the DONATE NOW button. Joe, I'm a friend of your dad, I just want to tell you to hang in there body ,keep up the hard work and never give up, the Lord is working on you and soon you will see the results of all of us praying for you,I'm doing everything that I can to raise funds belive me,May the Lord bless you, your family and and those real friends that keep you up with that spirit. Joe, May your beautiful perspective and emotional strength return to you with physical movement one day. Best wishes! Joey, Panama here we go. Dale! Hey Joe... Your perservance is remarkable! We should all learn from you! Keep up the hard work. It will pay off. We are all cheering you on! The sky is the limit! God Bless you! Joey, stay focused on your goal and you will attain it. I know you have what it takes and you will keep striving until we reach our goal. God bless you. Go Joe! Hi Joey! It''s your Birthday!!! And I want to express my admiration to your effort, enthusiasm and hard work with your recovery. Never give up! Continue believing in God, you are so special for Him. God always be with you, with my Dear Lucy and with All your Family. Joey, We hope you have a speedy recovery from your surgery, and may it help us achieve our goal. God bless you. Go Joey Go! Hi Joseph, We’ve watched you grow through the years ... always the leader of the neighborhood pack! We’ve shared wonderful times and have many awesome memories of your childhood. Your mom and I still get together and talk about our hopes and dreams for all of you. Steve and I still miss seeing your faces down the block! Today, our family celebrated a very special Bat Mitzvah as my cousin Joe and Lori's daughter, Annie, reached this very important milestone. You'll remember from Jason's and Justin's Bar Mitzvahs that the child who becomes a Bar/Bat Mitzvah must perform a Mitzvah (Good Deed) project. Annie was the most perfect Bat Mitzvah girl I've ever seen, her project was to sell wrist bands to those attending her celebration and ask for donations to grant a wish to a child through the Make a Wish Foundation. Annie raised a nice sum and spent time with the child and his family whose wish she will help come true. Our hope and wish for you is for a full recovery. We know that you are working hard towards it and believe that all of our prayers will be answered. We are so proud of the progress you’ve made and will share your story. We know your dreams will come true! Hi, Joey: We just wanted to let you know that our thoughts and prayers are with you each and every day. We are all very proud of you and of all your accomplishments. We have watched you grow and know in our hearts that God has a very special plan for you. And you are ready for His calling. Being faithful and obedient to His will is the basis for our survival here on earth. We ask that you may always feel the Lord’s presence and embrace during each moment of your life. May you sense His guiding existence in each challenge that you face. May His peace and joy also be with you always, and may you realize how deeply loved and precious you are within His eyes and ours as well. Remember to keep in mind, “I can do all things through Christ…” Phil 4-13. With Him, all things are possible. We see the faith in you, and your determination and know that you ask guidance from above. You, your parents, Sam, and Lucy are clearly another example, that God is truly Love. May His blessings always surround each and everyone of you. The future is yours, never give up, Go, Joe, Go! We love you! GO Joey GO! May the music that motivates you. Help keep you strong to your faith and may the power of the Holy Spirit be with you to guide you every step of the way. GO Joey GO! Hi Joey, I do not know you personally,I know your MOM & Dad you have been blessed with a wonderful family & caring girlfriend. I spent times crying and praying with your MOM she is a wonderful MOM emotionally strong and full of positive thoughts and hopes for you. You could not ask for a better MOM & DAd. I saw your Dad cry and it broke my heart to see a man cry with such pain and agony. So much for the sad times you made it!!!! My family has prayed for your recovery and we have seen you overcome many hurdles but most of all I have prayed for you to know that God has sent people to help you. God knows at times you may not be all courageous on your own, but God is on your side he goes before you and behind you as you struggle to get through. Dream envision were you will live and what music you will create in the future as a Music Engineer. Imagine your havings kids of your own it is all there for you. Trust you will see God's will. God is your refuge and strenth. You could be our son and I am so glad you made it. May God bless you and your girlfriend whom I know has been with you thru all your hard times. Remember the best is yet to come your times are in God's hands. Trust in him! Hello Joey, I know that with faith, hard work, and determination you will reach your goals. God Bless you, From the Somano Family..